That lace-trimmed grey silk slip peeking from underneath the skirt's hem isn't just for decorative purposes. It's actually because the skirt is lined with white cotton gauze, which is meant to be worn with bare legs. Worn in winter, it would totally ride up to my waist due to friction. Not a good look. But worn with a slippery silky layer preventing friction by separating it from leggings or opaque tights, means problem solved! Army green parka, BERSHKA. 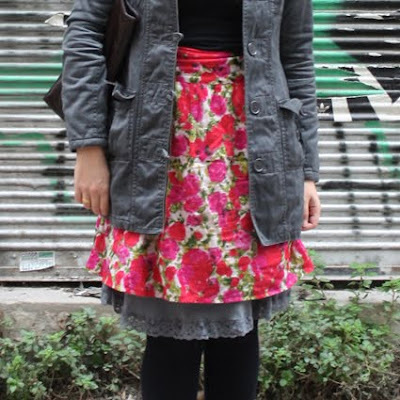 Floral skirt, KOTON. Grey silk slip layered underneath, BENETTON. Black extra-long leggings, PULL&BEAR. Grey round-toe maryjanes, LA STRADA. Brown tote bag, MANGO. GREAT COMBINATIONS! I LOVE YOUR FLORAL SKIRT AND YOUR JACKET! Λατρευω τα παπουτσια σου !!! That floral skirt is so pretty! Such a fabulous layered outfit! The skirts real pretty too.